As indicated above, you should try to interrupt the automatic extension of the fillet along tangents by avoiding the very small radiuses. Make them to sharp corners and add fillets there later. I tried to do it only on the longer front part, and it doesn't work. Unless I don't understand correctly what you mean by "interrupt the automatic extension of the fillet along tangents by avoiding the very small radiuses"
I tried only for the front (green) lines and most of the part desapear (was cutted) after I did the fillet. I also tried only the front top line, which is not near a curve and it did the same thing. Here isan example where I approximated the B-splines with arcs. They are easier to control for me. It shows that fillets are possible even with larger radius. That's very interesting! You redraw the sketch and used arcs in place of B-splines? I think the issues were raised by the very small radiuses in the B-splines. Using only arcs it was easier for me to change or remove them. I finally got it like I wanted! I had removed the small radius at the right lower corner. I could replace it with a fillet applied later. Usually it is much more stable to integrate the fillets in the sketch, here it was the other way round. If you keep your solid in one body with Part Design you can fillet between features. I will look at that freedman! To pratice and learn, I did the design again and change some things in the design. But again I had some problem with the Fillet. I used only lines, fillets and arcs in the sketch but it didn't work. Than I separated the part into several pieces in several sketches, and it work. 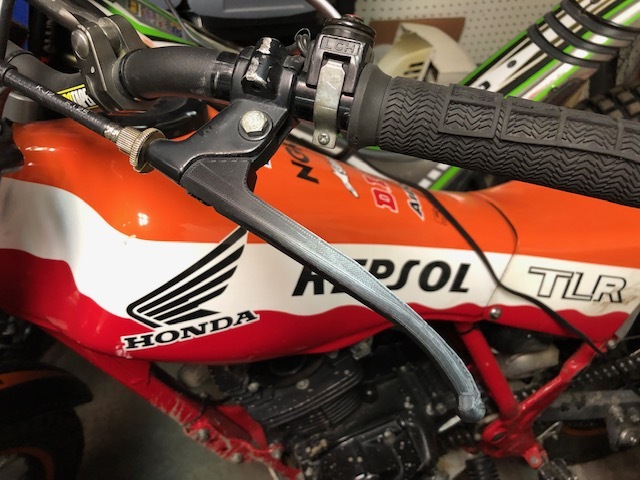 I used the clutch lever and changed the placement of holes and grooves to do the brake lever. It work fine. I printed one in PLA to see how it look and if it work on the bike. That's very nice! 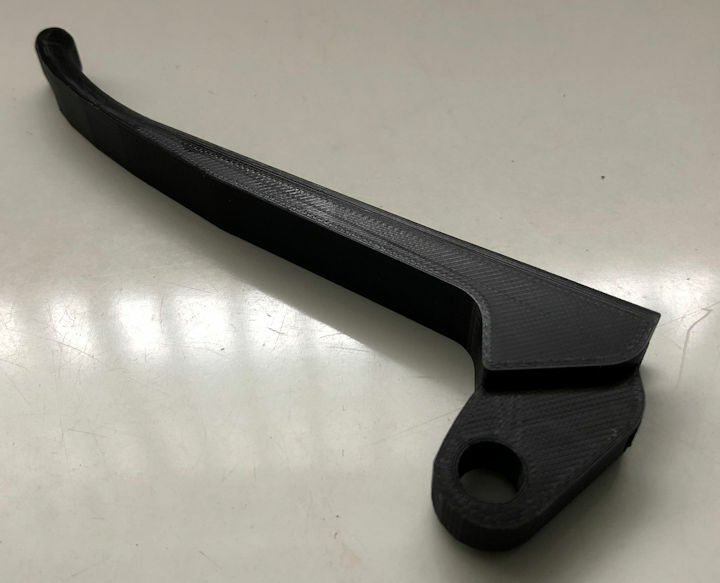 Next I'll print both levers in ABS. Cable drum brakes are so ... cool ? I would advise that you check on the PLA printed part if the hole where the cable "nub" inserts is deep enough so the nub can correctly fit into (especially on the blind side). The cable shall be able to goes out really really straight through the groove to prevent stress and shearing. Yes openBrain, I noticed that the hole was not deep enough on the first design and correct it. And you are right, this Honda is an old 4 strokes 1986 TLR with drum brakes. The green one on the back, is an Ossa Tr280i. A 280cc 2 strokes with disk brake and weight 147 lbs. I do modern and vintage trial events. I also have a 2016 Honda CRF1000l Africa Twin and a 1977 Honda CB750 cafe racer. I love bikes!